The new CW series The Flash is upon us. With reports of more than 4.5 million viewers for the premiere, chances are that you or some of the people in your congregation were watching this latest show based on a DC superhero. As I’ve discussed in other blogs for Pittsburgh Theological Seminary, I’ve come to love the language of superheroes. They all have attributes that identify them regardless of the artist or medium. Flash’s attributes would have to be the red suit, the lightning bolt on his chest, and the bolts on his mask/cap. It turns out that his attributes aren’t exactly original. The lightning bolt is an easy one. It belonged to Zeus. The bolts on his cap, though, are more interesting. They look almost like wings. If you dig into the history of the Flash, they used to be wings. 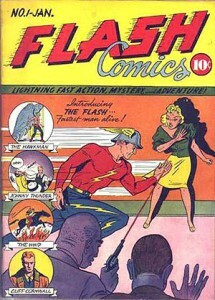 It was in January of 1940 that the Flash first got his own comic book . He looked quite a bit different from the hero of the new CW show, but the beginnings of the uniform are there. So in classical mythology we find the son of lightning, wearer of a winged cap, with supernatural speed. Mercury is mentioned in the Bible. That means… the Flash is in the Bible!? In Acts 14:8-18 we find Paul and Barnabas preaching, teaching, and healing. In the midst of their work, people mistook them for Hermes and Zeus. They assumed that Paul and Barnabas had supernatural powers because of the healings, and they figured Paul for Hermes because he did most of the talking – like a messenger would. Naturally Paul and Barnabas immediately did their best to correct the people. They reminded everyone that Hermes is just a character in a story. Then they proceeded to talk about the ways the Living God had been present in the lives of people throughout generations. Paul used the stories of the swift son of lightning to teach people about God. I’m not talking about a sustained campaign over the next six months, but when you overhear people mention that they watched it, follow Paul’s example. Here’s how you can teach a one-shot Bible study on the Flash. Read Acts 14 and talk about the connections between Flash and Mercury/Hermes. There are plenty of pictures all over the Internet that would be fun to show. Then ask people to talk about the ways God has impacted their lives in real ways. By the time you’re done, people will know more about the book of Acts. They’ll also know more about how God is at work in their own lives and the lives of those around them—all thanks to the Flash. Relax superfans. I know Jay and Barry aren’t the same people. I’m just claiming that the “Barry Flash” developed from the “Jay Flash” artistically, not canonically. Written by the Rev. Derek Davenport ’05, director of enrollment and program co-director of the Miller Summer Youth Institute at Pittsburgh Theological Seminary. Derek is also an alumnus of the Master of Divinity (MDiv) Program. Derek researches church symbolism on his website www.preachingsymbols.com.